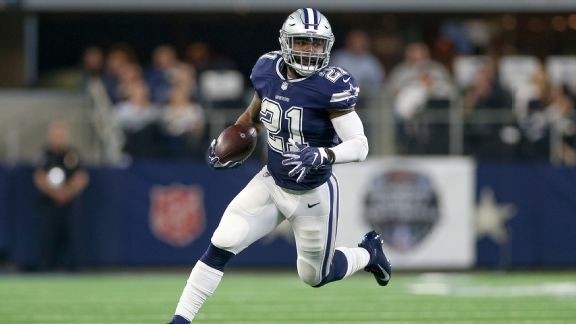 FRISCO, Texas -- One series into Monday’s game against the Tennessee Titans, Ezekiel Elliott had 29 yards on five carries. It looked like he was primed for a huge game that would lead the Dallas Cowboys to a much- needed win to get back to .500 at the midway point of the season. Even Elliott thought he was in line for a big day. After a strong first quarter Monday against Tennessee, Ezekiel Elliott faded from the Cowboys' game plan. It was only his third career game without a fourth-quarter carry, according to ESPN Stats & Info. Here are his total yards by quarter Monday. For the rest of the game, Elliott had only 31 yards and the Cowboys suffered a deflating loss, putting them on the wrong side of history. The Cowboys have never made the playoffs after starting a season with a 3-5 record. And Sunday's date in Philadelphia won't make it easy to turn the tide. But if the Cowboys are going to make the playoffs, it will be on the strength of a running game led by Elliott. Elliott is fourth in the NFL in rushing through eight games with 680 yards on 149 carries. He has three 100-yard games on the season. The Cowboys have the sixth-ranked rushing offense, averaging 128.8 yards per game. Through that lens, the Cowboys’ running game looks similar to what it did when DeMarco Murray led the NFL in rushing with a franchise-record 1,845 yards in 2014 and when Elliott had a franchise-rookie record 1,631 yards in 2016. He entered this season with at least 80 yards rushing in 23 of the first 25 games of his career. He has five games this year with fewer than 80 yards rushing. It is no secret how the Cowboys want to play. They built their team with the running game in mind. It might be against the trend in an NFL where teams are throwing the ball over the place with success because of the change in rules that make it much more difficult for defenders, but it has worked. It worked in 2014 when Tony Romo was the quarterback. It worked in 2016, Prescott’s rookie year. Entering the season, the Cowboys knew they would need to work through issues in the passing game but believed they could run the ball effectively, but Pro Bowl center Travis Frederick has not played a snap because of an auto-immune disease. His replacement, Joe Looney, has played well, but there have been struggles at other positions that led Garrett to change his offensive line coach from Paul Alexander to Marc Colombo two weeks ago. Rookie left guard Connor Williams had knee surgery on Wednesday and will not play Sunday. He will be replaced by Adam Redmond or Xavier Su'a-Filo. “Certainly we want (the run game) to be a big part of what we do,” Garrett said. “It starts with the guys up front, but it’s really everybody. Tight ends blocking, receivers blocking, certainly the impact of the runner. Trying to get the running game going against Philadelphia is a tough ask. The Eagles have the second-ranked run defense, giving up just 83.8 yards per game. Saquon Barkley of the New York Giants is the only running back to have success against Philadelphia, picking up 130 yards on 13 carries, including a 50-yard touchdown. Only one other running back has more than 36 yards rushing against the Eagles this year. In four games, a quarterback has led the Philadelphia opponent in rushing. Elliott has played in just two of the four games against Philadelphia since he entered the league in '16 either because he was being rested or suspended. He had 22 carries for 96 yards in 2016 and 103 yards on 27 carries last season when the Eagles rested most of their starters before their playoff run.